Weaning means accustoming the child to alternative foods in place of breast milk or formula foods. After about 4-6 months of age, breast milk is insufficient to meet with the caloric as well as nutritive requirements of the child. Hence it has to be supplemented with food from outside. 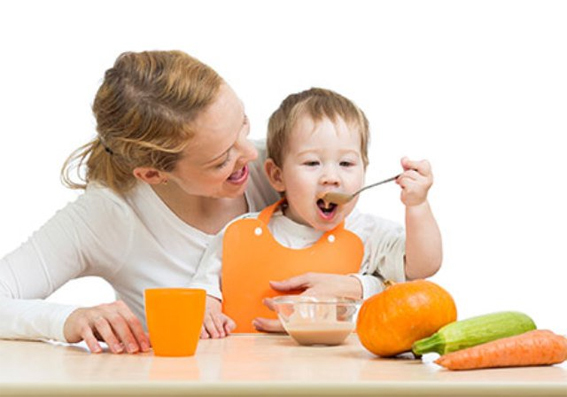 Weaning is the first step in the development of a diet pattern of the child and has far reaching consequences in defining the food habits in the future. Successful weaning is an essential step in the overall growth and development of the child. Weaning should be done gradually and with maximum comfort of the mother and the baby. Readiness is the key, at the same time voluntary efforts are needed to achieve it. One food item should be introduced at a time. Cereals, vegetables, fruit, eggs, dairy and lastly poultry and fish, is the sequence in which foods should be introduced. Foods rejected once should be reintroduced after a while. A balance of carbohydrates, proteins, fats, fibre and water is needed to prevent problems due to weaning. Force feeding, anxiety and punishment are to be avoided completely. Rather, the child should be encouraged to participate in self feeding with lots of praise, cuddling and positive reinforcement. The common problems encountered are resistance to weaning by the child, poor intake, moods, rejection of food, vomiting, diarrhea or constipation, disturbances of digestion, colic, nutritional deficiencies, growth failure, anaemia, infections and allergies. A patient approach is needed to tackle these problems and to get to the goal. Homoeopathy helps greatly in treating problems in this crucial phase of development of the child. Right from emotional reactions to infections and allergies, homoeopathy has answer to all. Homoeopathy treats every child distinctly, and provides holistic solutions to the problems. Homeopathic and biochemical remedies are also used to treat nutritional deficiencies. Homeopathic medicines are safe and without any side effects, which make them best suited for long term use to tide over multiple problems during weaning.